Some finished objects at last, even if only small. The hats are for charity giving. Not a good photo but that's life this morning as far as photos go. They aren't really as wide at the bottom as they seem to be. Just the camera angle. The adult green one is made from Patons Jet and is very soft and cuddly. The child's hat is from Bendigo Classic 8 ply. Both use the same cable headband. However, in the child's hat I did as the pattern suggested and picked up the stitches on the inside of the band which then folds back double for extra warmth. It's a beautiful morning here, very much an autumn morning. However it's windy and forecast to be stronger later. Looking from the upstairs balcony, I can see the Blue Mountains very clearly. Sometimes it's hazy and on occasions even smoggy in that area near the trainline between Penrith and Parramatta. However, everything is crystal clear today and from the other side of the balcony I can see sandstone cliffs which I think is possibly Wattamolla Beach in the Royal National Park south of Sydney. 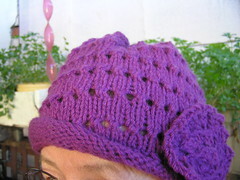 These hats are part of Lynne's winter textured knitting, after the long lacy summer. Another poor photo due to wind. I had everything sitting nicely and as I pressed the camera button a gust of wind moved the vest so the photo is blurry. This is for little Finn, my youngest grandchild who is three. He does not like sleeves very much and even when at the ZigZag Railway in the mountains last week, we could not get him to put something warmer on top of his Tshirt. I was surprised to feel his warm arms as it really was quite cold there. He goes to pre-school two days a week and has a wonderful time. This involves getting quite dirty. I thought perhaps he would wear a vest which would be some extra warmth. This is Patons Smoothie, a 100% acrylic. To knit such yarn is very unusual for me. I normally knit pure wool or a blend which is mostly wool. Now his mum is pretty good about washing handknits, but I thought this could just go in the machine regularly. I'm going there on Tuesday so will try to remember the camera to get a better shot. I found it hard to find a vest pattern on the net for a little boy so made this one up. Using a size chart from here and my own gauge, I worked out sizes. This pattern could well be knit in the round and split for neck and shoulders. 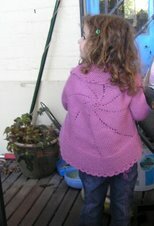 However, I started at lower back edge and knit up and over the shoulders, then down the front. That did mean side seams were needed but they were just short, straight seams. No armhole shaping at all. I wasn't particularly happy with the yarn which I found splitty. Occasionally it also came untwisted too. However, I persevered. It was certainly cheap. This used about 1 1/2 balls, in other words perhaps 300 metres. When I reached the lower edge on the front, I decided that size chart or not, it really wasn't long enough for Finn who takes after his dad in height. His father is 6'5" and I think Finn will be much the same. So I decreased a few stitches and did the rib for extra length. Then I had to pick up stitches on the back for the same. The pocket was done by picking up some more stitches and joining to vest by knitting two together on the straight edges. A bit of sock wool blanket stitch and voilà - a vest. If it does not fit well I'll make note of adjustments and do another. If he doesn't like it, then I can always give it away. I have little spare money so don't look at eBay often. Saves temptation. However, I really wanted some Cleckheaton 12 ply in a discontinued colour so had a look last week. I found some and made a bid. Also found some more Patonyle sock wool, a discontinued line in the 50 gm balls. I bid on that too. On Friday I had won both. I was strict with myself and had set a limit beyond which I would not go. Not the top as far as I could afford, but the limit I allowed myself. Both came in well under my limit. Seven balls of Patonyle for under $20 and the Cleckheaton was well under $30 for an unopened pack of ten 50 gm balls. I paid on the spot, so they should be here tomorrow or Tuesday. I love the cabled band of those beanies. There will be link from my blog before the end of next weekend. Nice job on the hats and vest, and excellent stalking on eBay - 7 balls of Patonyle for under $20 is just fab! OMG I need to go back to ebay and yarn. I stopped a long time ago. that's excellent value!